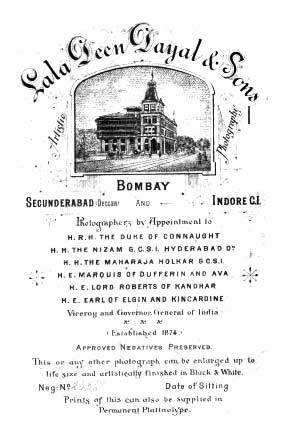 After Indore and Hyderabad, the Bombay studio was the large, prestigious establishment occupying the first floor of what is today the Khadi Bhandar store. The Bombay studio recorded portraits of eminent citizens in addition to the pristine charm of Bombay and Pune cities at the turn of the century. Situated in the heart of the Fort area, (132 Hornby Road), the Bombay studio was a major attraction in the city both for locals and tourists. The exhibition of pictures captioned “ Views and Types of India” was open to the public daily from 8 am to 7 pm. It was indeed a major tourist attraction. Given below are extracts from the studio catalogue. We have tried , regardless of expense, to provide this large room with everything that Oriental luxury and artistic taste can suggest. As we cordially invite everyone to come and see it for himself, we will not go into details. We think they will not regret their visit. It is not only a sumptuously furnished drawing room, but a picture gallery as well, containing photographs of many persons and places of special interest. I am delighted with all I see in the studio which is one of the most magnificiently upholstered, scientifically lighted and ventilated, artistically decorated, I have ever seen or heard of in India. It is a feast to the photographic amateur and to all lovers of art. The most splendid studio. It is an ornament to Bombay It deserves the patronage of Bombay citizens. It seemed I was in some fashionable salon of Paris. The popular art of photography seems to have the culminating point of perfection. I have been in London studios, and I must say this is the best I have ever been in, and congratulate the proprietors on it. The best collection of views I have ever seen in England, America or India. Raja Deen Dayal is certainly an Artist. The studio compares more than favourably with the best in London and Paris. In Bombay this is the first studio I have seen so elaborately and so luxuriously fitted up. I was agreeably and pleasantly surprised to find my old friend established in such beautiful quarters in Bombay. I have long known him in Hyderabad, and have seen what he can do in a limited area. Here, in the first commercial city in India, with rivalry on all sides, he has with one bound come to the front. He deserves every credit for his energy, enterprise and ability. It is a real pleasure to spend a stray half hour in such a Studio. Raja Deen Dayal is all attention to the visitor, and his assistants are very courteous. 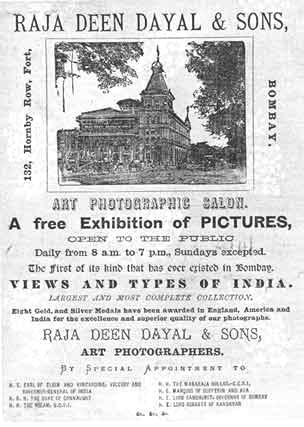 Raja Deen Dayal's Studio is the pride of Bombay. There is an interesting story behind the birth of the Secunderabad studio. The story goes that the Nizam’s army commander and personal secretary asked Deen Dayal to invite the Nizam to his place which was a small area in a temporary building. The Nizam agreed to be photographed in his uniform at the studio. Within 24 hours the shamiana tent was erected (Deen Dayal had his own portable studio about 30 feet by 20 feet with muslin on one side for light). The place was decorated with simple furniture, carpets and sofas. The dress which the Nizam would wear was laid out. The Nizam arrived at the studio at 8 am for he had to attend a parade at 9 am after the sitting. Deen Dayal received him on the roadside and showered silver coins to the waiting crowd after turning them over the Nizam . The full staff of Deen Dayal saluted the Nizam in the Moglai style and the Nizam was most pleased with the honour bestowed on him and the elaborate makeshift arrangement for the occasion. After dressing, about 8-10 pictures were taken. The Nizam then asked his ADC whether this place belonged to the photographer and he was told that Deen Dayal had taken this on rent about a month back. The conversation took place when the Nizam was having tea and he ordered that the place which was in his jagir(property) should be permanently presented to Deen Dayal. 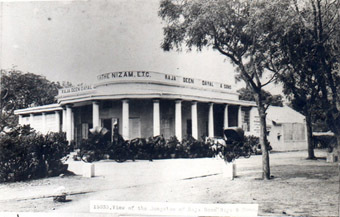 Thus was laid the foundation of the larger studio which was patronised by the Nizam’s noblemen and British army officers.The studio was situated in the centre of Secunderbad towards the Parade grounds and the Nizam used to come to Deen Dayals twice a year at the New Year Parade and H.M. King George's Birthday Parade on 3rd June. The Nizam used to change his civil dress into a full brocade and velvet uniform before going to the March Past about half km away. There was a large garden at the back of the studio with several mango and guava trees. On the north side he had a big stable where the firm had three carriages and five horses ready at any time of the day. The zenana studio was another memorable entity. The purdah system was so widely entrenched in Hyderabad that no wise commercial establishment could have ignored its existence. Managed by one Mrs. Leverick, it did not lack the supervision of Deen Dayal. While the ladies were dressing in the ante room, Dayal set up everything and instructed Mrs. Leverick. She had to just press the shutter and take the required pictures with various exposures and backgrounds which were all set beforehand. Despite the special facilities, there were very few women who opted to be photographed. In fact we do not have a single picture of Deen Dayal’s wife.